This is quite the way for the Edmonton Oilers to make an entrance back in North America. The Oilers opened the season against the New Jersey Devils in Sweden for the 2018 NHL Global Series, but have now landed in Boston for their first game of the season in American that will take place against the Bruins on Thursday night. And the Oilers made sure that everyone would notice their entrance in Bean Town. 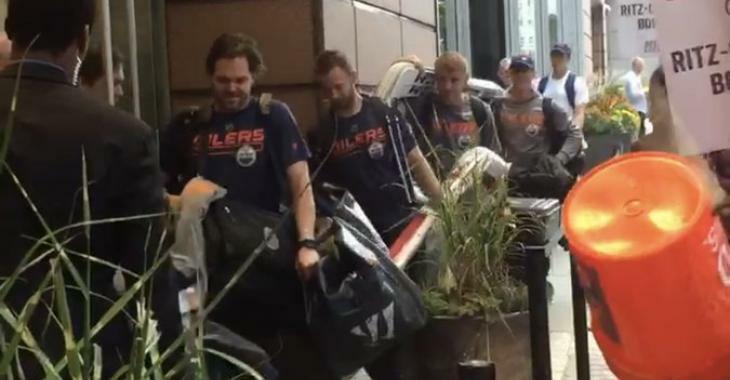 Upon arrival after a long flight over the Atlantic Ocean, the Oilers got in Boston and were ready to check in at the Ritz-Carlton downtown, a hotel from the Marriott branch. However, as soon as they got off the bus from the airport, the team was greeted by a group of hotel workers on strike. The hospitality worker union Unite Here said that 7,700 of its members in seven cities are off the job and on picket lines, having failed to settle on new collective bargaining agreements with the company, according to The Huffington Post. However, the workers on strike should understand: the Oilers probably booked this hotel way before the strike began... The Canadian team was simply looking to get in and crash in their beds, after a long flight and a disappointing first game in which they lost 5-2 at the hands of the Devils. We still do not know if the workers made quite a ruckus outside, which could prevent the Oilers from resting and be ready for their second game of the campaign. The Bruins, despite losing their first contest 7-0 at the hands of the Washington Capitals, have managed to win the following two games and be ready to crush the Oilers on Thursday.